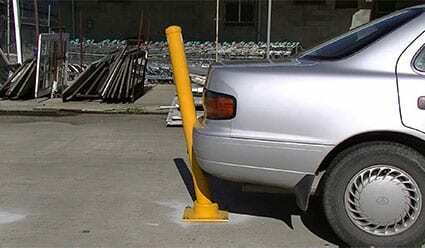 SRB: Finally, a protection bollard that can withstand impact and keep going strong. Protection bollards have a flaw. 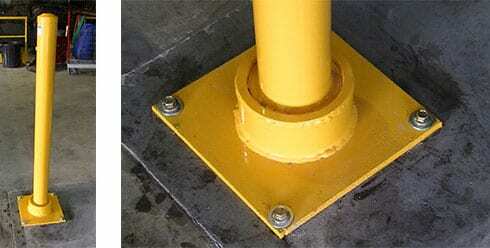 While a properly constructed and fitted bolted down bollard will almost always do its job, protecting people and property, it can be rendered useless. Here's the story. 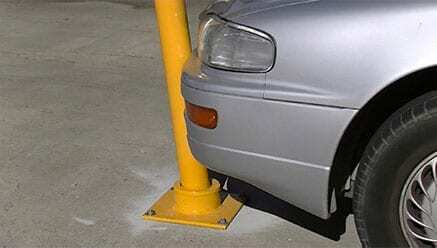 When a protection bollard gets too friendly with a vehicle, it can be ripped from the ground (causing untold damage to the footings and concrete/asphalt) while also damaging the vehicle, sometimes with some expensive repair work required. Yes, the bollard has done its job. The driver will get the fright of his life and will most likely drive more carefully in the future. But the damage caused can leave everyone with a bad taste in their mouth. There must be a solution. This is where my brand new Rebound Bollard comes into play. This little ripper of a device has a special rubber membrane system that allows the bollard to move upon impact. The driver knows they've hit something - and will come to a stop - and the bollard absorbs the impact of the strike, minimising damage to the vehicle, the footings and the bollard itself. Once the pressure has been removed, the bollard will snap back to its resting position, ready to do it's job again. Check out the video for more on my Rebound Bollard. To see my full range of bollard images click here. 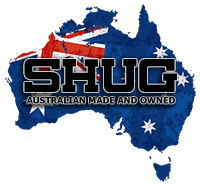 If you'd like to get a quote for The Shug Rebound Bollard please click here.